Blubrry has partnered with Live365 and together they are introducing Podcast2Radio. Podcasters who sign up for Podcast2Radio will immediately have access to the millions of listeners that stream content via Live365 distribution partners. It is easy for podcasters to get convert their shows into a curated stream. * Sign up for a Podcast2Radio account. When you finish doing those simple steps, Podcast2Radio will push your podcast out to radio directories such as Live365, TuneIn, Windows Media Guide and more. 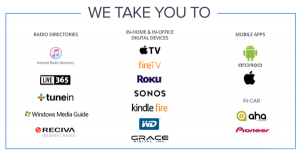 They will also get your podcast on in-home (and in-office) digital services such as AppleTV, Roku, Kindle Fire, and more. Your podcast will also appear on mobile apps including iTunes, Android, and Pioneer. The Live365 platform is going to help podcasters to get their show on almost all streaming platforms. It gives podcasters plenty of opportunity to have their show discovered by new listeners and to increase their audience size. Blubrry, as you may already know, is a podcasting community and directory that gives creators the power to make money, get detailed audience measurements, and host their audio and video. Live365 started in 1999, and is the original and leading online radio network offering broadcast services and streaming radio programing.